Today is the day that the Moon was to be within 2 degrees of Spica in the daytime sky. Cloudy weather and even a bit of rain was the order of most of the day today. But I just went outside a little bit ago, and realized... hey, it's clear! Well, clearish. Not exactly superb transparency by any means. People are surprised that they can see stars during the day that are not the Sun. “What? Really? How is that possible?” It is possible because bright stars are... well, bright! The trick is that you need to know the exact spot to look, because you won't have the crutch of a dark sky to make the star's contrast with the sky as obvious. So how to find a star in the sky this week? Use the Moon as your guide. On Friday August 29th, the Moon will be a waxing crescent. Now, some people are still surprised that the Moon can be seen during the day, but that's another matter. Even crescent like this shines at magnitude negative nine, more than sufficient to be seen in a clear blue sky. Will Mars ever look as big as the Moon? Mars will not EVER appear as large as the full Moon, not until humans are within ~475,000 miles of it. And Mars will never be that close to Earth short of some catastrophic solar system event which everyone would certainly know about. 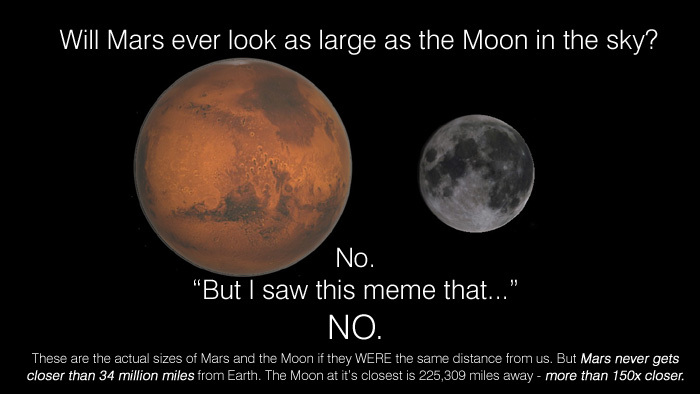 So just stop with the "Mars is as big as the Moon" stuff already. When looking at planetarium software for objects I discuss in weekly Eyes on the Sky videos, I often see interesting objects I wouldn't necessarily find if I were looking for them in the night sky. That is because I am usually looking at the software with a wider field of view than I can usually see through an eyepiece. In addition, this summer has been absolutely terrible for observing where I am located; some forest fires up in Canada coupled with weather systems that keep a near constant cirrus-to-full-stratus-cloud cover has made it hard to get much good observing accomplished. Neptune is just slightly below the dimmest naked eye objects from a dark sky site. Most humans can see down to about magnitude 6.5; at the moment, Neptune glows at magnitude 7.6. That puts it easily within the visibility of most any 7x35, 8x40, 7x50 or 10x50 binoculars from just about anywhere. The key simply knowing where to look. Have you ever driven down the road at night, and had an oncoming driver be completely oblivious to the fact that they have their high bean headlights turned on? You flash at them, they ignore you... and so you squint, perhaps slow down, and look to the side of the road away from the lights, hoping you don't hit the approaching vehicle. And yet, in communities across the United States (and many across the world), we routinely put up with similar lighting situations. Lamp posts with lights that go every-which-way, porch lights that blast light everywhere including out into the street, and perhaps worst of all, floodlights that are mis-aimed and can actually blind drivers who are subjected to them. There aren't a whole lot of comets that are terribly bright right now, but one is making a rather rapid beeline up the northern sky. And a couple of days this month, it will be very close to some rather well-known and easy to find stars. That should make locating the comet quite a bit easier. Here's an animated GIF detailing where this comet will be from now through the end of August. A caveat: This comet is NOT all that bright. It peaked last month in July at around magnitude 5.7, which is fairly bright for many comets that are visible on any given night. But it starts this series of images on August 19 at magnitude 8.3 or so, and will likely drop at least a half to a full magnidue by August 30 that ends this animgated gif. On August 2, 2014, members of the Kankakee Area Stargazers, the Kankakee Valley Theater Association, other members of the community, artist-in-residence for Kankakee Brandi Burgess and I put together a show for about 55 audience members at the Willowhaven Interpretive Center east of the Kankakee / Bradley / Bourbonnais area. See this previous blog post for information about the event; see pictures below for some fun scenes from that night. The program ran 45 minutes, and amateur astronomers plus about half the crowd stayed for another hour and fifteen minutes to look at Saturn, Mars, the Moon and some other objects through a couple of telescopes that were brought by a couple members of the Kankakee Area Stargazers. Below are few photos from this theater-astronomy-mythology-outreach event. Theta Serpentis is somewhat off the beaten path; over 7 degrees from 3.4 magnitude Delta Aquilae and more than 15 degrees from Altair and Cebalrai, it isn't exactly in a well-traveled area of the Milky Way. But it does reside along the plane of our galaxy from our perspective, and that makes both the journey to it - plus some other objects nearby - a worthwhile one to make. Start at Altair, dropping south to Detla Aquilae, and look for Cebalrai in Ophiuchus, a star that has it's own interesting deep sky objects nearby. From there, it's more than a full binoculars or finderscope field of view to reach the star, so using some other stars close by to get our bearings is helpful.